With the release of Warner Bros. The LEGO Batman Movie this weekend the studio has now went ahead and released the first trailer for The LEGO Ninjago Movie. Admittedly, I know nothing about whatever Ninjago is, but a bit of quick reading tells me that it is a line of sets produced by Lego. Using elements from their previous Ninja series I'm assuming this one moved a lot of units in the stores and thus the reason it has now produced its own entry in this ever-growing LEGO franchise that Warner Bros. Animation is turning over like hot cakes. Still, as I haven't played with Lego's in quite some time none of this tells me anything about what the movie might be about or what the story might entail. And so, Ninjago follows Lloyd (voice of Dave Franco) or L-loyd if you ask his father, who is a Green Ninja, who must team up with other ninjas to defeat Garmadon (Justin Theroux), the Worst Guy Ever, who also happens to be Lloyd’s dad. The trailer opens up making it seem as if this might be the first LEGO film where we're supposed to take things a little more seriously given the setting and ancient influences, but all of that is quickly dispersed when the film begins to play up the tropes of such movies. The bits given their moment here are solid and had me chuckling if not for the intent of the jokes, but the fact that Phil Lord and Chris Miller really did set a staying tone with that initial LEGO movie to the point that we'll now have two LEGO-themed movies in 2017, both of which look to be a blast simply by virtue of the fact they're well-aware of what they are. This isn't an epic action movie with sweeping landscapes or large battle scenes, but an animated movie with plastic figurines as the main characters and it would be silly to be serious. Taylor Swift‘s “Bad Blood” is a nice touch and it seems by reading the synopsis this first trailer gives away little of what story the film will actually be telling which is rather enticing and has me all the more curious to see how the film separates itself from what will have come before it. The LEGO Ninjago Movie also features the voice talents of Fred Armisen, Abbi Jacobson, Olivia Munn, Kumail Nanjiani, Michael Peña, Zach Woods, Jackie Chan, and opens on September 22nd, 2017. 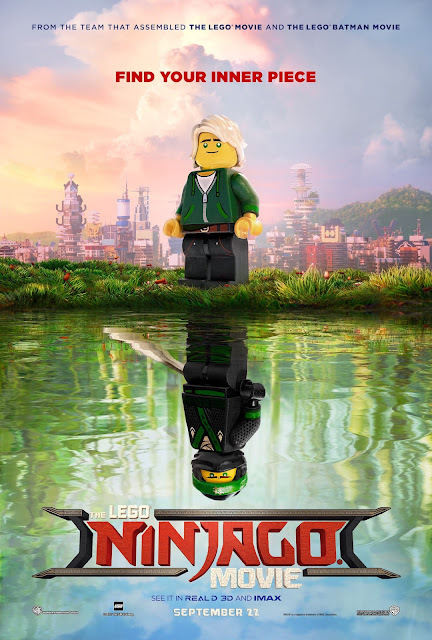 Synopsis: In this big-screen Ninjago adventure, the battle for Ninjago City calls to action young Lloyd, aka the Green Ninja, along with his friends, who are all secret warriors and LEGO Master Builders. Led by kung fu master Wu, as wise-cracking as he is wise, they must defeat evil warlord Garmadon, the Worst Guy Ever, who also happens to be Lloyd’s dad. Pitting mech against mech and father against son, the epic showdown will test this fierce but undisciplined team of modern-day ninjas who must learn to check their egos and pull together to unleash their true power. Jackie Chan (“Kung Fu Panda,” The Karate Kid”) stars as Master Wu; Justin Theroux (“Magamind 2,” “The Leftovers”) is Garmadon; Dave Franco (“Neighbors 2: Sorority Rising”) plays Lloyd; and Olivia Munn (“X-Men: Apocalypse”) is Lloyd’s mom, Koko. Making up the secret ninja crew, Fred Armisen (“The Jim Gaffigan Show,” “SNL”) voices Cole; Abbi Jacobson (“Neighbors 2: Sorority Rising”) plays Nya; Kumail Nanjiani (“Mike and Dave Need Wedding Dates”) is Jay; Michael Peña (“Ant-Man,” “The Martian”) is Kai; and Zach Woods (“Silicon Valley”) voices Zane.